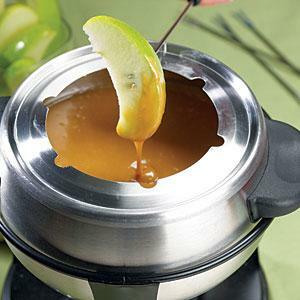 2 ingredients is all you need to make this Caramel Fondue be the hit of your next party or gathering. It couldn't be easier or more delish than this! Start this in the slow cooker ahead of time and spend your day worrying about other things, not your dessert! Place caramels in slow cooker; stir in condensed milk. Cover and cook on LOW 3 1/2 hours, stirring occasionally, until caramels melt and mixture is smooth. Turn slow cooker to warm through the serving time. Serve with apple slices and pound cake squares. Great tip! I have one quick question, what can I substitute for the condensed milk? I am lactose intolerant. Trish, great question! I did a little searching and found a recipe you might want to try instead. I have not tried it yet, so if you do I'd love to hear how it turns out! Found you through the Thursday Favorite Things Blog Hop. Thanks for stopping by to visit! I love the Favorite Things Blog Hop! Great idea! I cannot wait to try it. Can any leftovers be stored in the fridge and be reused? Is there such a thing as left over caramel sauce? Just kidding! Jessica, you can store the leftovers in the fridge. It'll thicken up,so when reheating you may want to thin it out with a little bit of milk. So excited! I'm going to make this for 30 second graders at our "Fall Celebration." Yum! Makes me want to be a second grader! Hope it all goes well!